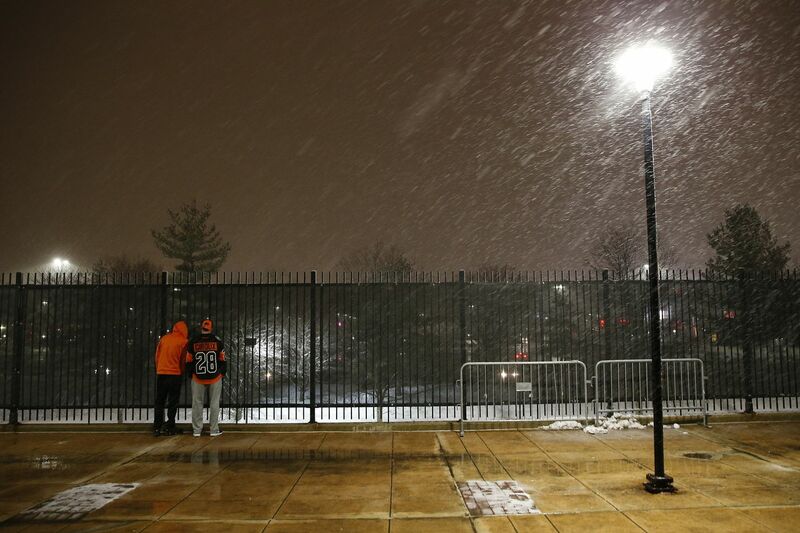 Flyers fans wait to catch a glimpse of a Flyers player as snow falls at the Wells Fargo Center in South Philadelphia Monday night. The second round of a winter storm affecting the Philadelphia area left a new coat of snow overnight but its impacts vary depending on where you are located in the region. Here’s the latest of what you need to know. A turnover from rain to sleet has made driving hazardous in Philadelphia and surrounding counties, including Burlington County, where a number of accidents were reported on I-295 and the New Jersey Turnpike. Conditions are even more challenging north and west of the city. Roadway conditions should change during the day as the precipitation shifts eventually to rain. PennDOT has lifted restrictions on empty tractor trailers, all double trailers and other vehicles on interstate highways in and around Philadelphia. No major problems reported by SEPTA, PATCO, NJ Transit, or Amtrak. Flights between Philadelphia International Airport other cities affected by winter weather — mostly in the Midwest, New York State and New England — are experiencing delays and 101 flights to or from PHL and those locations have been cancelled. Passengers should check with their airlines for updates. Courts and county offices in Bucks, Chester, and Montgomery Counties are closed today. How the day plays out depends on where you are. A winter weather advisory was in effect until 6 p.m. for most of the region when the morning started. But the advisory was lifted in Atlantic and Cumberland Counties in South Jersey as the turnover to rain made its way north. Northern Montgomery and Bucks counties, in the meantime, are under a more serious winter storm warning until noon Wednesday. The National Weather Service offers this general timeline for Philadelphia: Freezing rain and sleet before 2 p.m., followed by rain. The high temperature will be around 39 degrees. Total daytime sleet accumulation of less than one inch is possible. The rain is expected to end early Wednesday and give way to partly sunny skies. It will be windy with a high of around 40, according to the National Weather Service forecast. Philadelphia public schools and Archdiocese of Philadelphia schools opened two hours late. Some schools outside the city closed but many more opened late. Some of those that planned to have delayed openings later announced they would close for the day.